Randy Brown is a commercial lines account executive at the Milton office. He has been with Avery Hall since 2016. His specialty is working with farmers throughout Delaware to help them identify the appropriate insurance lines to cover their incomes, equipment, and homes. 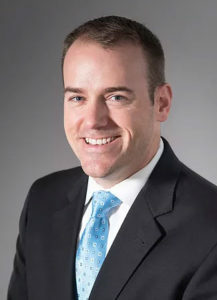 Prior to Avery Hall, Randy was the senior marketing representative for a regional insurance company, representing both Maryland and Delaware. Randy was born in Silver Spring, Maryland and raised in Upper Marlboro. He received his Bachelor of Science in business management from Liberty University in Lynchburg, VA.
His family includes wife Anne and daughter, Claire. In his free time, he enjoys spending time with his family, playing golf, running, reading up on American history, and vintage baseball. Randy is very active in his community, and volunteers with the Rotary Club and the Milton Chamber of Commerce. The office for Avery Hall is on Broadkill Road, directly across from Food Lion. Stop in today and see what Avery Hall can offer your business!